This engraving depicts the 26 martyrs, the Christian missionaries who were executed for not leaving Japan after the decree of the Japanese government. This spectacle is portrayed at the start of Martin Scorsese's Silence. These missionaries refused to recant their faith and become apostates, such as Fr. Ferreira did in the film. 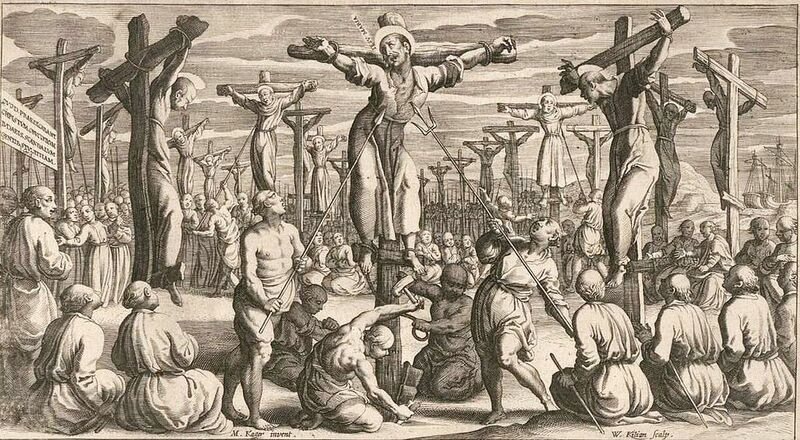 This engraving is in all likelihood a production from the account of an eyewitness to this event. 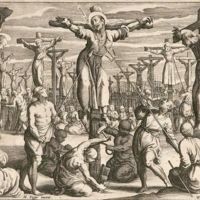 Wolfgang Kilian , “The 26 Martyrs of Japan at Nagasaki (early 17th century),” Medieval Hollywood, accessed April 24, 2019, http://medievalhollywood.ace.fordham.edu/items/show/104.